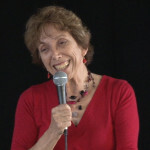 Rinah Sheleff is a retired lecturer in Bible Studies at the Kibbutzim College of Education, Tel Aviv. She specialized in teaching methodologies that incorporate the creative arts as a way of emotionally connecting students with the human dilemmas inherent in Bible stories. Rinah is also a professional storyteller and a movement instructor. Currently she is working with a team of storytellers on a project designed to make Talmudic and Hassidic stories accessible to the public at large. She is a founding member of a women's Rosh Hodesh group that has been meeting for over 20 years, and was also active in creating the Tali School in Hod HaSharon. And she loves Susie Dvoskin.